Now that it’s 6 months since we launched College Park parkrun, it’s time for an update on our experience of creating a parkrun USA event. I wrote a blog piece about it shortly after our launch, but a lot has happened since then. We have made it through our first winter, we have learned so much, and we feel more connected than ever to our community. A parkrun is kind of like a race: it’s on a measured course and there are published results. But it’s not really a race, and the term is frowned upon at parkrun: the focus is on individual participation, progress, and social support rather than on competing with others. And the events are totally free to participants, who register once and then can just show up at any of 1000+ parkrun events around the world with their personal parkrun barcode. A standard community road race costs thousands of dollars and weeks or months of organizational effort, for a single event. But parkruns are entirely free, due to the use of parks (= no road closures or police needed), year-round consistency (= no paid advertising), technology (= easy results management; no need for event registration or timing chips), no swag or prizes (= just focus on the running and community), and a broad volunteer base (= shared ownership). In the half year since we started we have held 28 weekly, timed 5k events, with about 1500 runs by 500 runners. 80 people have volunteered at least once. It has been even more fun than we expected. I am co-event director for College Park parkrun, together with my wife, Andrea Zukowski. Andrea was the one who really got the event started, after being inspired by parkruns that we did on family trips to the UK, where parkrun draws over 100,000 participants every week. It is far from inevitable that parkrun will see the explosive growth in the US that it has seen in the UK, South Africa, or Australia, but it is clearly turning a corner now, and the next couple of years will be interesting. At the start of 2016 there were only 4 in the US. Our event was the 7th. As of today there are 9, and by the middle of the summer there may be a dozen. There are 3 basic elements to a parkrun event: the venue where the event is held, the team that puts on the event every week, and the community that takes part and supports the event. We have learned a few things about each of these. The venue is the physical setting for your parkrun. It includes your course, its location, and other spaces such as the café for the post-run meetup. Our parkrun follows a simple out-and-back route on the Paint Branch Trail, part of the Anacostia Tributary Trail System in College Park. We were fortunate that there’s a little over 2.5k of nicely shaded trail with no road crossings and almost no opportunity to go off course. Marshaling the course could not be easier. I had worried that the out-and-back might be discouraging to slower parkrunners, because they would see runners so far ahead of them. On the contrary, it creates an extra opportunity for human contact, because everybody sees everybody else during the run. Our tailrunner also has become one of our photographers, as all of the runners pass the tailrunner on the course. Prince George’s County Parks Department was initially skeptical when Andrea asked them for a free permit to hold 50 events per year. But they have come to be enthusiastic partners. Their goals and ours overlap — they want people to use their parks, and they want to remove barriers to participating in fitness activities. 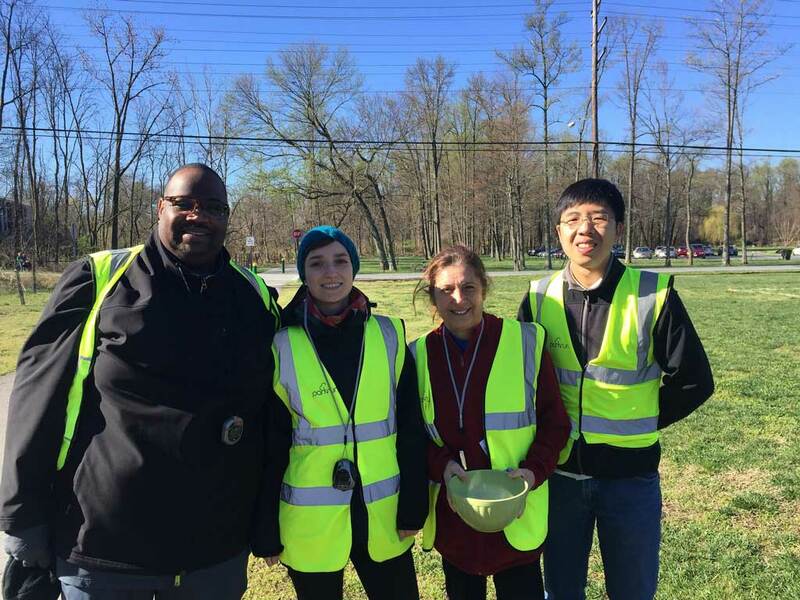 On April 1st we partnered with them and with UMD’s Good Neighbor Day for a combination of parkrun, trail clean-up, and planting trees near our start/finish area. A student group made a nice video about it. And the parks department has expressed interest in having additional parkrun events in other parks in the county. We have kept them informed about our event and we regularly acknowledge their support. It helps that parkrunners are responsible park users: 5 minutes after the tailrunner finishes every week, we have disappeared without a trace, with not a hint of litter. Good Neighbor Day: Parkrun 5K from Danielle Stein on Vimeo. 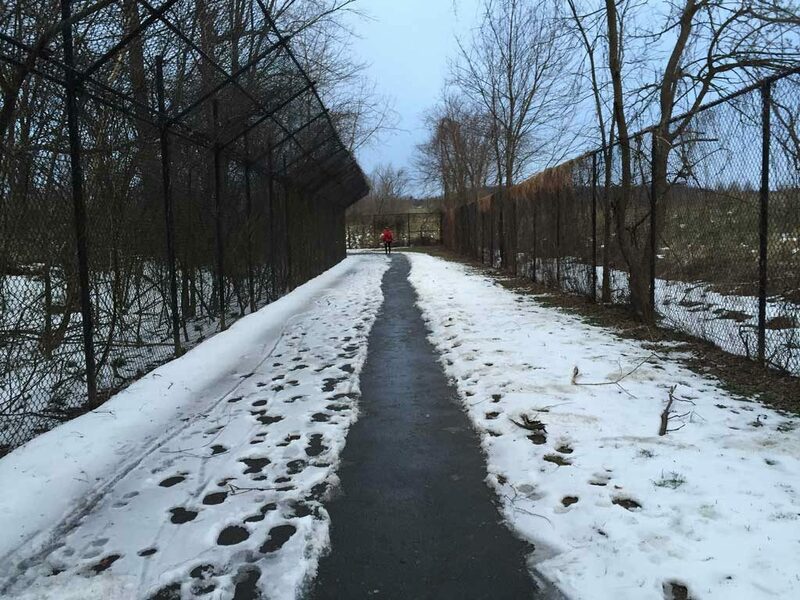 We were worried that we might have to cancel a few times during the winter because of snow or ice on the trail, but that wasn’t much of an issue. One week we had to cancel because the roads were too icy for safe driving. Another week we had to shovel snow from the bridges and a few shaded spots on the course. But otherwise the course has held up very well. Our coffee shop is a valuable part of our venue. 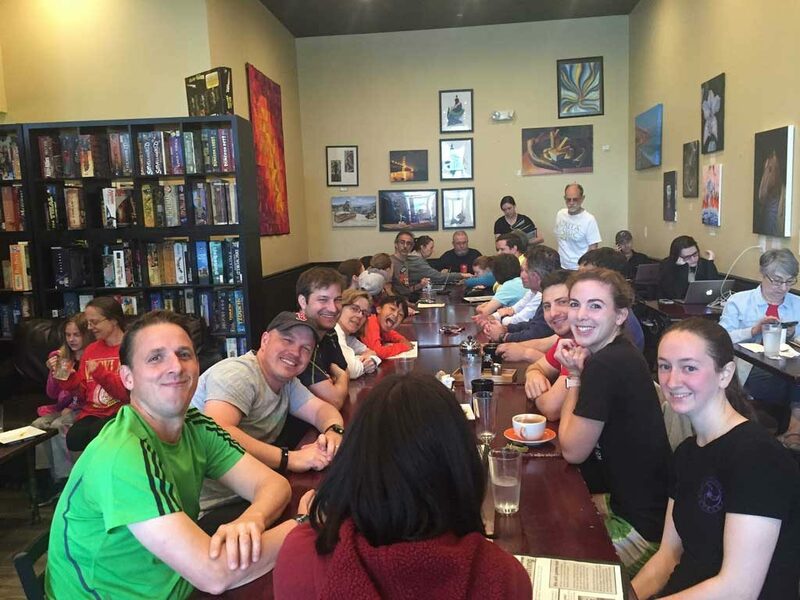 We routinely have 20-30 people at The Board and Brew after parkrun. It’s a great opportunity to connect with participants. HQ recommends (but does not require) that all events have meetups like this. Now we understand why this makes such a difference. Overall, we have been very happy with our venues. The scenic, peaceful course and the cool coffee shop add to the attraction of starting off your weekend with parkrun. And both of them are things that our community is justifiably proud of. Even many locals are surprised to learn about these parts of the city that they were unaware of. The team is the group of people who make your parkrun operate smoothly, every week, year round. It includes the event directors who hold everything together, a core team who are centrally involved in the weekly events, and the volunteers who make each individual event possible. When we started we weren’t too worried about our ability to commit our Saturday mornings to parkrun. We had already been holding informal “proto-parkruns” for 9 months before we were official. But we weren’t sure how much other time it would need or whether we’d screw up the results or lose the equipment. Our bigger concern was how we were going to find the team of 7-10 volunteers that we’d need every week, especially in the middle of winter. And what about the weeks when we were out of town? We have been pleasantly surprised on almost all counts. The basics of managing the weekly run seemed complicated at first, but after a few events it got to be pretty easy. parkrun really does make it straightforward to put on a well-managed timed 5k event every week, with minimal fuss. We can fit all of our gear into the back of a car, event set-up and take-down takes 5-10 minutes, and generally the results are emailed to participants within an hour of the last runner finishing. Not many paid events can offer that. We have learned that things sometimes don’t go according to plan, and that those times can be the most fun. One week the stopwatch died (we reconstructed the results from photo time stamps). Another week the run director got stuck in the traffic jams headed to the January 21st DC Women’s March (we quickly trained up a new run director over the phone; on that day we were in Ohio at the Mansfield parkrun inaugural). And another week novice marshals stationed themselves only halfway to the correct turnaround point (our quick-thinking first finisher picked up the course marker and ran with it to the correct location). It has been surprisingly easy to get volunteers every week. We have worked hard to build a community around our parkrun, and the more that people see others that they know volunteering, the more likely they are to volunteer themselves. Lisa Wilson and Hump Plotts are our most dedicated volunteers, and they are already close to earning their purple shirts for volunteering 25 times. Lisa typically walk-jogs and she likes the tailrunner or turnaround marshal role, as that also gets her a run credit. Hump has heart issues and wouldn’t dream of doing a 5k, but he’s our golf course marshal almost every week. He walks around at his assigned spot and tracks his steps on an app, so he’s getting exercise too. His cardiologist is very happy with the progress that this has initiated. At the other end of the running experience scale, Cindy Conant is an elite masters runner who one week set a new age-graded record for all of parkrun USA, and then was back a couple of weeks later enthusiastically volunteering. Sometimes we go to bed on a Friday night not sure how we’re going to cover all the volunteer roles, but somehow it always works out. Sometimes people just offer their services at the start line, or they bring a friend or family member who is happy to pitch in. Or one of our faster runners takes over an easy job like barcode scanning shortly after finishing their own run. It always works out. Our core team of people who serve as run directors has been small for the first few months, but now that we have got to know our parkrun community better, we have been able to expand the core team from 4 to 11 people. This will give us more flexibility going forward. Some of these new team members are couples like me and Andrea. Half of them are people who we had never met before our parkrun started, and none of them are the people who we would have guessed would be part of the core team when we first started. Another pleasant surprise has been how much fun it has been for me and Andrea to work together as co-event directors. Yes, we’re married, but we have very different running backgrounds, different organizational styles, and different times when we’re able to work on parkrun business. But it has worked out great. There are different aspects of the event that we each focus more on. Andrea is the lead on working with our volunteers and partners, and she’s the main human face of the event. I do more on communications and photos, on getting to know our parkrunners’ stories and celebrating their achievements, on planning, and on relations to other events and to parkrun USA. I’m often on the road for work, and my role allows me to contribute even when I’m away. Being a parkrun event director has also been a great experience for Andrea, who is not a naturally confident public speaker. When we did our first practice run in January ‘16 she was nervous giving a speech to a dozen friends. 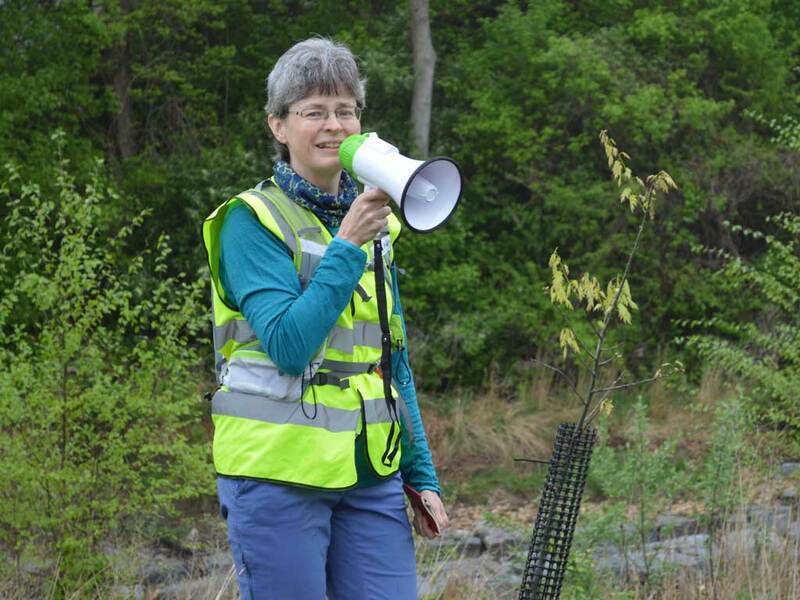 Now she confidently commands a bullhorn when addressing a crowd of 100 parkrunners. One indication that the team is working well is that Andrea and I have been able to run fairly often ourselves. Both of us have run 11 times, and there were a couple of weeks when we were both able to run. You don’t have much of a parkrun unless there are people who want to show up and run with you every Saturday. The most satisfying aspect of starting a parkrun has been getting to know so many people in our community, and seeing how warmly they have received parkrun. Since parkrun works on a just-show-up model, we’re never sure who is going to show up shortly before 9am on a Saturday morning. By the time we leave the coffee shop a couple of hours later Andrea and I are typically abuzz with stories of the people we’ve met that day or the achievements of people who we have come to know. We love how parkrun brings different people together, and we have never felt so connected to our community. We have been surprised at the range of people who we have got to know. Both our mayor and our former mayor are now regular parkrunners, as are many other people who are active in our community. Our regulars include Xander Mease, who is 4-years old and has cystic fibrosis. He runs with his mom Tara, and then delights in playing with the dogs who come to our parkrun. The regulars also include a good number of parkrunners aged 70-80+. Gus Campbell has already run 20 times and volunteered a few times too. 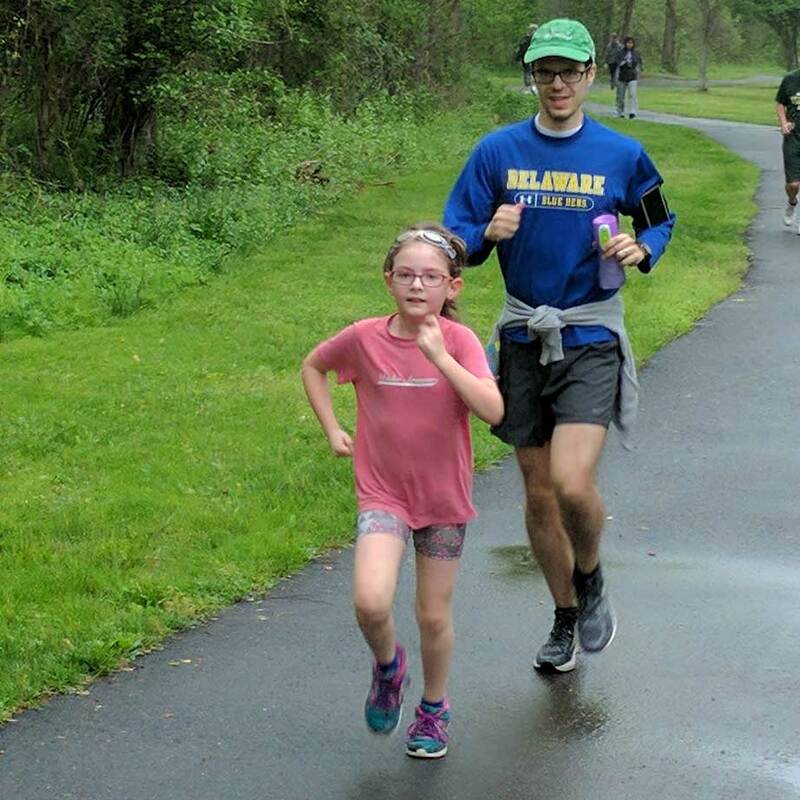 He drives down from Baltimore and often uses parkrun to meet up with his daughter Jen Murphy, a regular who is one of the new members of our core team. We see a few people who were barely active before parkrun, and we see a lot of people who are now more consistently active thanks to parkrun. It is so rewarding to watch their progress and to share in their satisfaction. We were not quite sure how many people to expect every week, but our numbers are not too far from our estimates. Weather plays a big role, and we have had as few as 25 runners on a miserable wet winter’s day, and close to 100 on a fresh spring morning. But we have learned that the more important indicator is whether people are coming back, whether they’re bringing friends and family with them, and whether they are offering to help out as volunteers. Our 500 participants to date have attended more than 3 times on average. But many have run a lot more than that. 34 of them have run 10 or more times already. We had heard about how parkrun grows mostly by word of mouth, but we hadn’t really appreciated how crucial that is. We have tried calling or writing to many different groups, and that rarely worked. Almost all of the growth in the event has come from individuals who have come along to check us out, really enjoyed it, started coming regularly, and then became advocates for us to friends and family. So our focus is on the experience of the individuals who join us, especially the experience of feeling welcome and being a person rather than a number. And we use social media and our run reports to share stories, reach friends, etc. A remark from one of our parks department people is telling: “We love this event, but you really have to see it to understand it.” A free, timed 5k likely sounds boring when there are so many other events competing for attention. And the social aspect can sound trite when you write about it. Participants don’t much care about the worldwide success of parkrun, as that doesn’t directly impact their personal experience. So that’s why it’s important that their personal experience be as positive as possible. We have not been uniformly successful in reaching our surrounding community. We assumed that we’d be able to fairly easily tap into the University of Maryland student population. Our parkrun is practically on their doorstep. But it has not been so straightforward. We have seen quite a few grad students, and a good number of faculty and staff. We have seen a few undergraduates, and our registrations have a lot more 18-25 year olds than the typical parkrun. But the dominant demographic group in our city is not the dominant demographic group at our parkrun. The social connections are presumably just as important for undergraduates as they are for any of our other participants. Not to put too fine a point on it, our team is dominated by old farts. (And remember that if you’re a college freshman, even your grad student TA can seem like an old fart.) We haven’t given up on this one, but it has proven harder than expected. Relatedly, our parkrun population underrepresents the diversity of our surrounding community, and this is something that we would like to change. 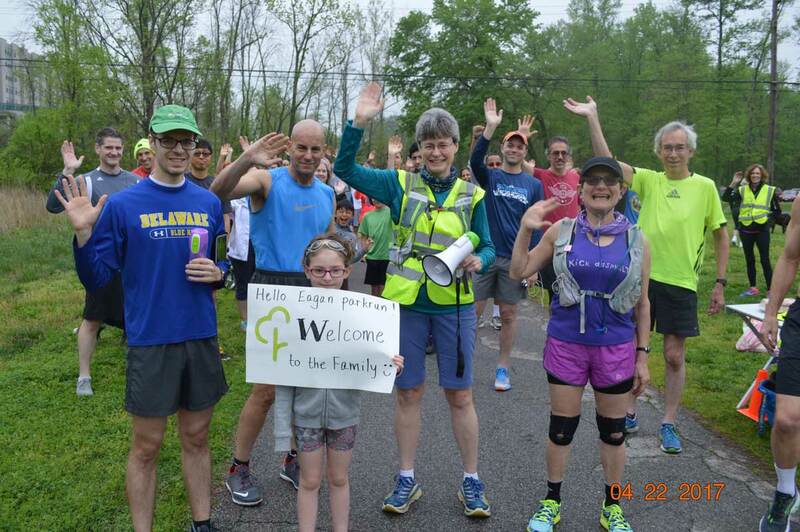 The phenomenon of ‘parkrun tourism’ is real, and at some US parkruns a lot of the participants are visiting parkrunners from the UK, Australia, etc. For example, the beautiful Crissy Field parkrun in San Francisco always draws a lot of international visitors. Our event has a more local feel. We have seen a handful of visitors from the UK and Australia, but parkrun tourists who are visiting the DC area are more likely to head to visit our friends at Roosevelt Island parkrun or Fletcher’s Cove parkrun. Just as often, though, we’ll meet Americans who are visiting the area and hence are learning about parkrun for the first time. Or runners from the broader DMV who are curious to see what this parkrun thing is. Or people who are interested in creating a new parkrun event of their own. We love meeting all these people. 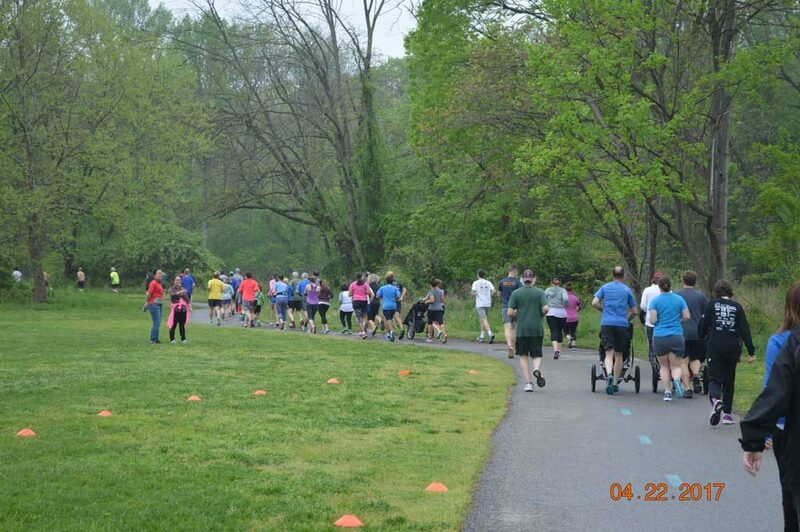 We have never regretted making College Park parkrun a part of our week. It has enriched our lives in so many ways. We’re not tired of it yet, though we’re happy to be starting to share ownership with an expanded core team. I’m also excited to see the growth of parkrun USA, and I’m happy to now be helping with that growth (mostly helping with communications). 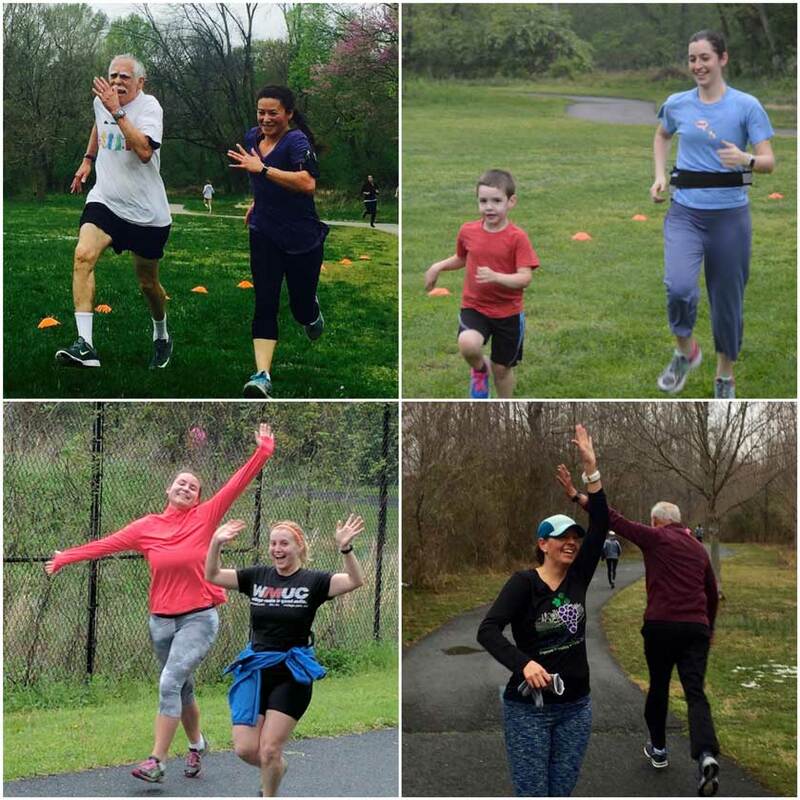 By June there will be twice as many events in the US as there were one year ago, including a second Maryland parkrun in Baltimore’s Leakin Park. It’s not hard to imagine that the total will double again in the coming year. It feels like there is momentum now. But parkrun USA is still tiny. On April 15th we celebrated a big new attendance record, the first time with more than 500 parkrunners in a day. That total for the entire country is smaller than many single events in the UK or South Africa. The numbers are also small relative to medium sized races that take place in cities across the US. But that is perhaps not a fair comparison. Big running events can cost tens of thousands of dollars to put on. parkrun serves large numbers of people at very low cost, and at zero cost to participants. More importantly, the focus on year-round consistency and community means that parkrun is offering something quite different than a paid one-time race, with greater potential to change individuals’ lives and to change communities. It also has potential to connect communities. I have already got to know many people in far flung places thanks to parkrun. The picture below is from the day when a new parkrun launched in Eagan, MN. I was in Minnesota to help with their launch, and back home in College Park our runners sent a message to welcome them to the parkrun family. People often ask why parkrun hasn’t taken off in the US like it has in some other countries. One opinion is that there’s nothing different about the US, it simply needs more work. The other opinion is that there are real differences between the US and the UK that make it harder for parkrun to take off. In my previous post I speculated on some possible differences: climate, society, crowded running and fitness market, accessible parks, and more. From where I stand now, I think that there is something to all of these, but I’m also cautiously optimistic that it is possible to overcome them. And I’m also convinced that the benefits for US communities could be even greater than in the UK. The US can use all the help it can get in combating obesity and chronic disease, and in improving social connections. I think that what we most need in the US is a runaway success that can inspire homegrown events, just as Bushy parkrun started to do in the UK 10 years ago. Up to now, all of the parkrun USA events have been inspired by successes in other countries. The chances are increasing that we’ll soon have homegrown events that can play that role. A small town event like ours is unlikely to be that iconic event, but events like ours could help to pave the way for larger events.